You do not have to be a fan of horology to take an interest in Maximilian Busser because he embodies our secret desire to follow our dreams or at the very least, for creative freedom. Max is to the watch industry, what avant garde film-makers are to the business machine of Hollywood. 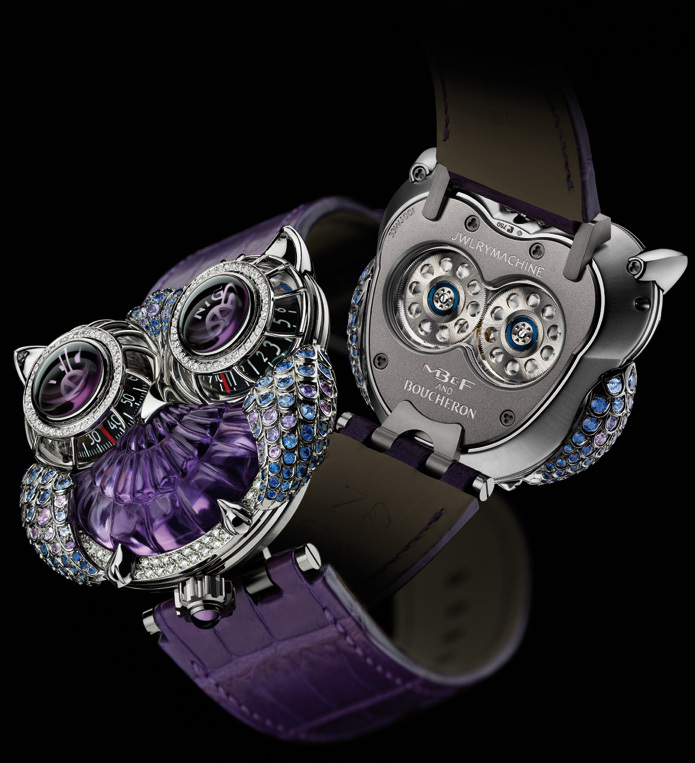 He is the partner and the creative face of MB&F, a creative label for luxury timepieces that concentrates on building mechanical concoctions that are meant to demand attention. Most people claim to be passionate about horology but with you, it shows. How did this interest grow and evolve into a need to develop your own brand? Max: MB&F is a life decision. All the time Harry Winston was growing and flying from success to success I should have been extremely happy, but the bigger the company was becoming, the more I was reaping the benefits (recognition, power, money…) and the less I was enjoying myself. And I just could not understand why. Then one day late 2001 my father passed away. That jolted me into rethinking my life “was I actually proud of my life ?” Everyone was proud of me, but I had the feeling that if I were to be run over by a bus tomorrow, I would not have accomplished something which made me proud. I understood most of that feeling came from the fact that I was always thinking of what clients would want, and of how to grow the company. I realized that if I were the owner, I would do neither ! So I started dreaming of my “dream company”, the company which would help give a meaning to my life (at least my professional life) . It would have to be very small – less than 15 employees – because in small structures everyone works as if it is their company and the level of enthusiasm and energy is maximal. It would have to be centered on my own personal creative thoughts and never consider what clients would like or want. And finally it would allow me to work only with people whom I respect and admire. But of course all that was impossible… till we did it. 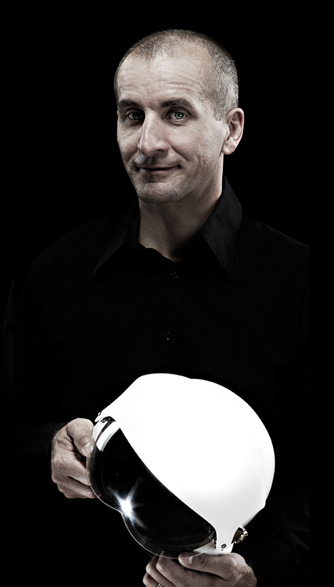 Designer Eric Giroud claims MB&F is the first real creative lab to further horological design and development. Given that this true, what does it say about the state of horological design currently in the wristwatch industry? Max: Watchmaking has lived two very separate eras: before and after the quartz movement. During the 600 years before quartz, the mechanical movement was the only way of measuring time – we tend to forget that today. How do you measure a chemical reaction? how do you measure a delicate manufacturing process? how do you measure the distance of an artillery shot ? So the practicality (precision, reliability) of horology was the most important element. Our lives depended on it! The quartz era changed it all. The mechanical movement is no longer useful or necessary. 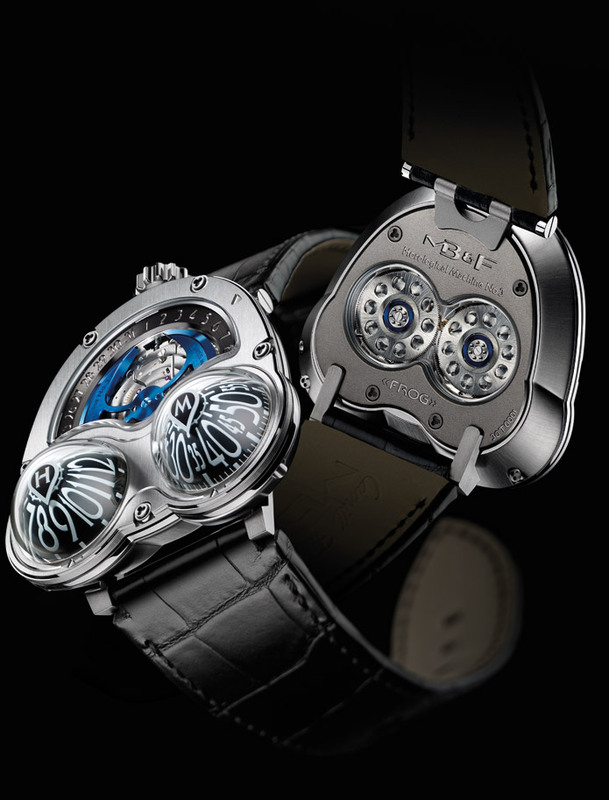 Amazingly enough, the watch industry continues reproducing the same products as before – yes there is an increase in performance with new materials in the movements (but is that performance necessary ?) 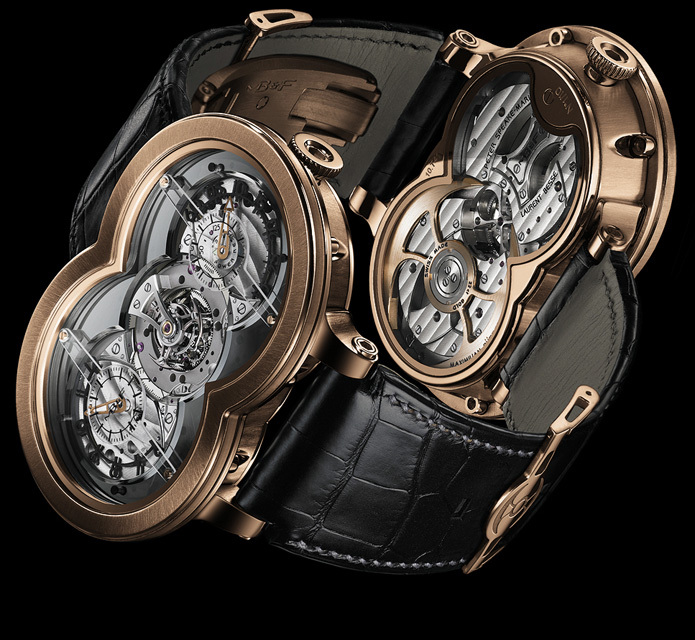 and yes cases have increased in size and integrated many new materials, but fundamentally the structure of our movements and watches remains pretty well identical to what was done one hundred years ago. Now, sales have soared so the Industry must be doing something right ! 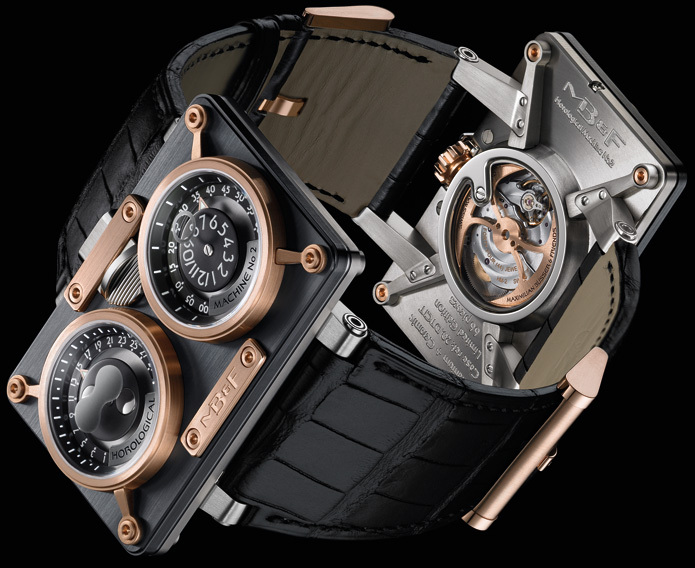 But 2010 signals to the world of watchmaking that there is another world out there begging to be explored. And it is just the beginning. A world where mechanical movements can be considered as kinetic art and be reworked by creators to become a real work of mechanical art on your wrist. How involved are you in the creative process and who did you enjoy working with the most? Max: I am totally involved! It is why I created MB&F: to be able to create what I believed in. 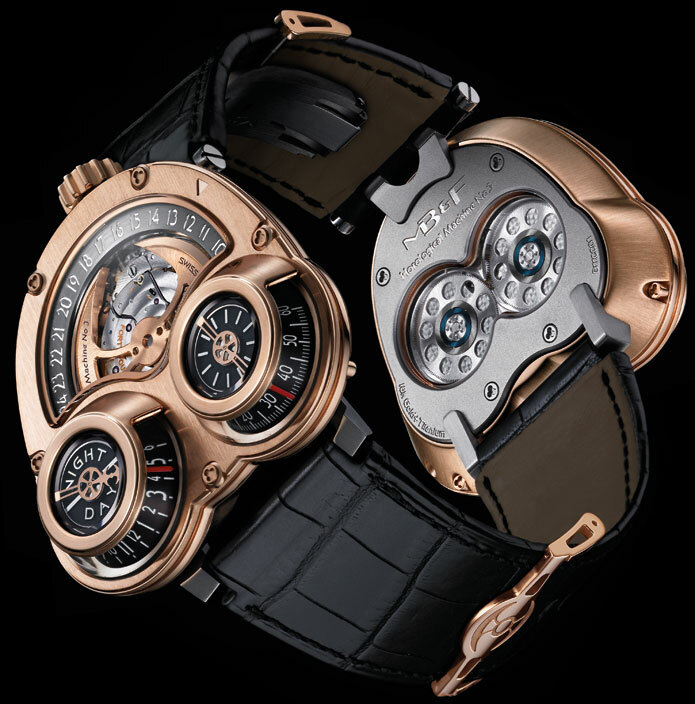 Now the creative process is not a solitary one; our pieces are always developed with Serge Kriknoff, my partner in the company and the head of all that is technical, and of course Eric Giroud, a great designer and wonderful friend, with whom all our Horological Machines have been designed. All three of us are set on a path of unbridled creativity and personal self discovery which will lead us to places we have never even thought of! It is said that you have a Nothing is impossible approach towards product development. But surely, there must be some limits? Max: Winston Churchill once said relating to winning the Battle of Britain: “We did not know it was impossible, so we did it”. That resumes pretty much our whole creative and development process. Do not always reproduce what has already been done, do not accept that because it has not been done, it cannot be. Of course every single one of our ideas necessitates to find new solutions and many months of testing, but if it was easy, it would probably take a big part of our fun away! I find it refreshing is that your brand is free of any tradition wristwatch brand euphemism and jargon. You describe your brand as a creative label. The designers you work with are your friends. The look and feel of your website is modern. 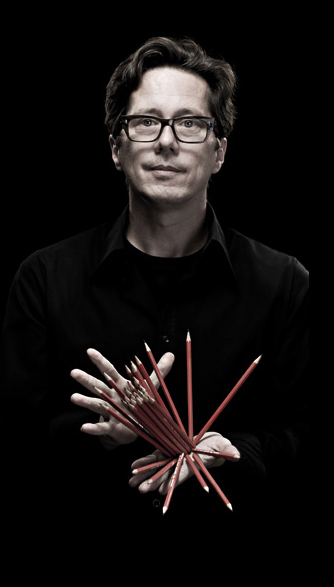 Your blog covers people who design visionary futuristic objects. Could you comment on the thought process behind this direction? 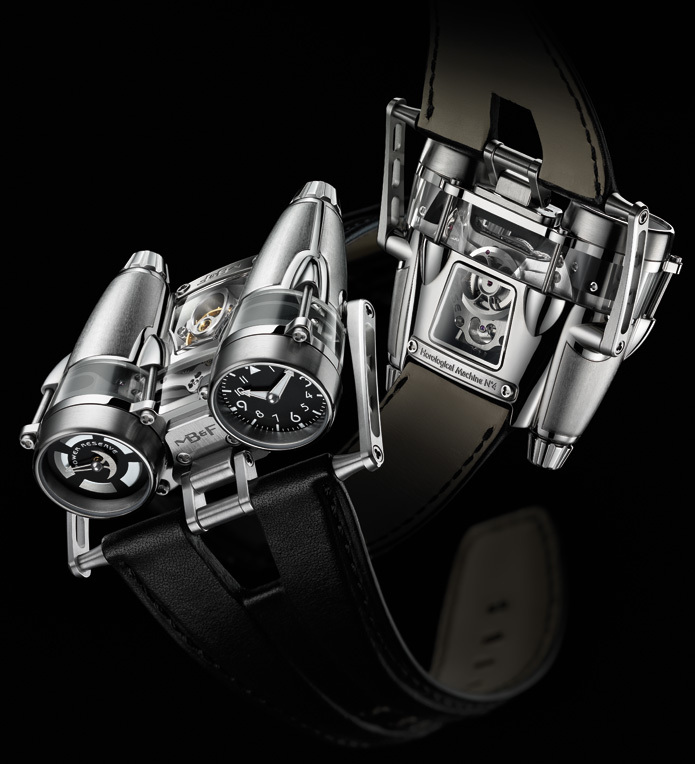 Max: MB&F is a personal quest, so therefore what you see is in great part a mirror of who I am. When HM10 comes out in 2016, I will be able to witness the last ten years of my life just by looking at HM1 to HM10. My father always used to tell me “treat others as you would want to be treated” and at MB&F we have made it our philosophy. Your HM4 Thunderbolt was recently awarded the prize for Best Concept Watch at the Grand Prix d’Horlogerie de Geneve 2010. How important is this milestone for you and do you think you achieved what you set out to do with MB&F? Max: Good grief ! We are just at the beginning of what we have set upon creating ! 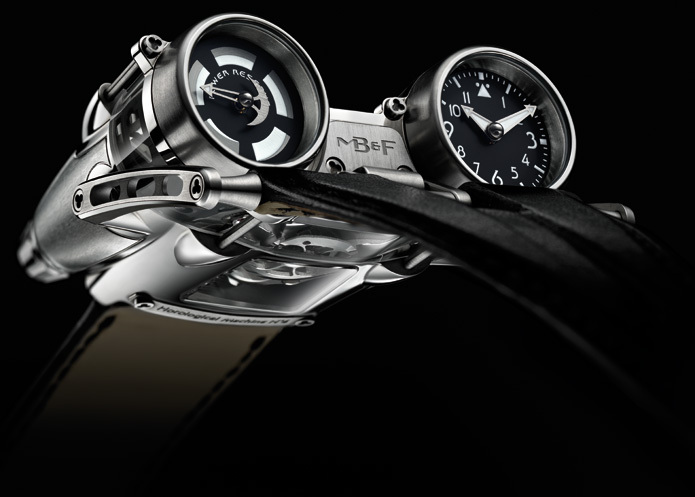 HM4 is nevertheless a milestone for MB&F; probably looking back in a couple of years we will realize there will have been a before and an after HM4. We do not create for awards, we create for the pleasure of pushing our own boundaries, we create to give a meaning to our professional life, but of course the recognition of our peers is very gratifying. There is nevertheless a weird sensation that we have been rewarded by the same establishment we have desperately tried to break free from! And finally, how much fun are you having? Max: It’s total Rock n’Roll !!! I love it !! !